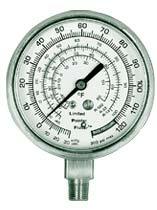 General purpose refrigeration gauges suitable for use with refrigerants that are non-corrosive to brass or bronze and where stem mounting is desired. Features include high torque hair spring movement and special pulsation dampener which limits pointer flutter. All CPI refrigerant testing instruments have easily accessible zero reset and include a restrictor in the inlet socket. Also available panel mounted. New dial inserts make it possible to easily work with many different refrigerant scales, using the same gauge. For your copy of A.N.S.I. 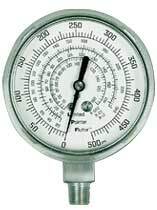 B40 standard gauge - pressure indicating dial type - elastic element, contact: The American Society of Mechanical Engineers,Three Park Avenue New York, NY 10016-5990 or call: 212/591-8500 Fax: 212/591-8501 www.asme.org.